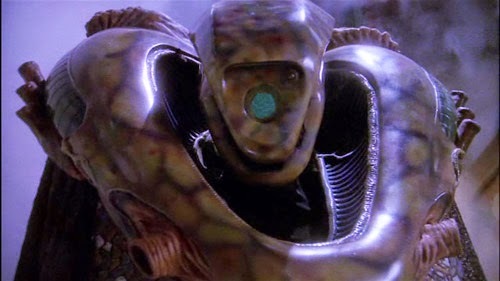 Ambassador Kosh, Babylon 5 © PTN Consortium. I promise that after today there won’t be anything about the recent sci fi fandom kerfluffle on this blog until Friday links. Absolutely none. However, there are several interesting conversations happening in the immediate aftermath which I want to share and make at least some comment upon. Since we now have the rest of the nomination results, it is possible to see what works would have been on the ballot if not for the slates. Here is one such guess: Alternate Timeline Hugo Awards. This list includes some very interesting things that I wish we had had a chance to vote on. The next headline isn’t entirely accurate. While George disapproves of any slate voting scheme, the purpose of his reviving his Hugo Losers party and this year handing out his own awards was to try to protest the deep schism and animosity: George R.R. Martin Holds Additional Ceremony After the Hugo Awards to Protest ‘Sad Puppies’. Years ago Martin founded the original Hugo Losers party, where people who were up for a Hugo that year could get together and tell each other they should’ve won… to wallow a little, yes, but also to commiserate, laugh at themselves and each other, et cetera. He let other people take over organizing it for years, but this year because of all the animosity flying around from every direction, decided to take it back. He rented a bar, invited anyone who has ever lost to the party. This year’s winners were also invited, but had to wear a conehead if they stayed. George had a bunch of trophies made, which he called Alfies, in honor of the late great Alfred Bester, and handed them out to people who would have been on the ballot, based on the nominating numbers, if you remove the slates. He handed out a few additional ones of his own choosing. By all reports, people had a good time. Why We Need Queer Escapist Lit. I get tired of having to defend wanting to see characters that are like me in my favorite genre. But we have to keep doing it. The false narrative that a lot of people on both “sides” of this issue often fall into is the idea that people of color, women, and queer people have only recently begun reading and/or creating sci fi/fantasy. This helps explain a big part of why that’s wrong: We’ve Always Been Here in the Fandom. Why the WIRED article on the Hugos misses the mark. Equally problematic is that the frame of reference of people on one side is so utterly disjoint from the frame of reference of people on the other side, that a lot of our attempts to debate have merely resulted in us talking past each other. Hugos & Puppies: Peeling The Onion. There are other differences, of course: On the SF/F genre and a-holes. On the Hugo Awards controversy, Sad Puppies, and why there are no winners here. [B]oth Hugos in the two fiction categories that actually were awarded went to translated works by non-anglophone writers, which is a first in Hugo history. Coincidentally, both are also the first Hugo wins for their respective countries of origin… I’m happy that they won, because their wins show that the Hugos are becoming a more truly international award. And yes, it’s problematic that a white Dutchman and a Chinese man, two writers who have nothing in common apart from the fact that English is not their first language, are both subsumed under the header “international SF”. But given how Anglo-American dominated the Hugos and WorldCon have traditionally been, it’s still a great step forward. I’m skipping a lot. Her full post is really worth that read. I hope you give it a look. Those of us who love science fiction and fantasy are going to be talking about this a lot over the course of the next year. Both the Sad and Rabid Puppies are vowing to be back. Vox Day, leader of the Rabids, is specifically threatening to leave a “smoking hole” where the Hugos once were. So the rest of us are going to have to make sure we participate in both the nomination portion and voting portion of the process next year. Because the avalanche may have already started, but contrary to the Vorlon proverb, in this landslide, each pebble has a vote, and we can make them count.